Although Photoshop Sketch is made for mobile devices, files created in the app can be exported directly to Photoshop CC for further editing and packaging as .psd documents. As the company moves forward with Project Aero, Photoshop Sketch’s position in the Creative Cloud family is likely to grow. When beta testing is complete, Project Aero will allow users to transform .psd documents into three dimensional AR files. With Photoshop Sketch, users will be able to quickly create content on their mobile devices, which can then ultimately be transformed into AR. Photoshop Sketch provides several print and digital canvas options with dimensions matching the artboards available in Photoshop CC, such as a 5 x 7” Postcard, 17 x 11” Tabloid, and 1,536 x 2,048 px Tablet Screen. Once a canvas is selected, the app behaves in a similar way to Photoshop CC, where users select drawing tools with various colors, textures, widths, and pressure points to create images. Tools can be used by touching the screen directly or with a stylus. There are 24 total tools available ranging from graphite pencils to soft pastels, each customizable to account for the capabilities of the physical tool. For example, aside from changing colors and stroke sizes, the “watercolor flat brush” has a drying option designed to mimic the way pigment behaves when used on dry paper as opposed to wet. Adjusting the pressure setting on the brush will determine how saturated the color appears, as it would when using physical watercolors. In addition to free range drawing, Photoshop Sketch also has preloaded polygons that can be inserted into projects. Ranging from basic shapes to french curves, these polygons are completely movable and scalable. Photos can also be directly uploaded into a project. Identical to Photoshop CC, Photoshop Sketch documents are created in layers. Users can create as many layers as they need for a project, and are all completely movable within the order of the document. This layer feature is especially important when thinking of Photoshop Sketch’s relationship with Project Aero, as the software will generate three dimensional AR pieces by splitting the layers of a .psd file. Photoshop Sketch also has built-in perspective grid features, which allows users to draw in 3D. 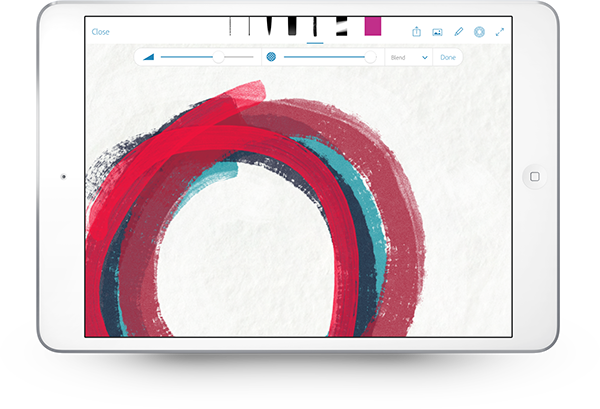 Included in the app with Photoshop Sketch’s drawing capabilities is access to Adobe’s online gallery of existing documents for inspiration, tutorials and guides, and direct connections to Adobe Stock and Beehance. Photoshop Sketch documents can also be exported as .jpg, .psd, .pdf files. Photoshop Sketch is extremely intuitive. Its interface is easy to use and does not require extensive knowledge of Adobe products in order to complete a project. With so much flexibility, it’s a great tool for both the novice user who wants to experiment with drawing in digital formats or the advanced creator working on a complex design. Since the interface is much simpler and user-friendly than Photoshop CC, Photoshop Sketch has the potential to give autonomy to new creators who want to work in digital or AR formats, but do not necessarily have the skillsets of a trained visual artist.